Canadian rapper Drake’s latest album Views became the first album to be streamed a billion times on Apple Music. The announcement was made by the rapper on the social network Instagram with two pictures celebrating the achievement. 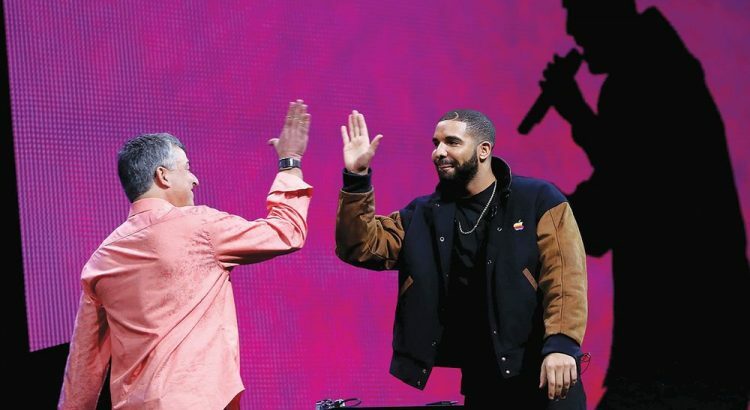 The first picture showed a celebratory plaque from Apple, signed by CEO Tim Cook and the second showed Drake posing with Cook, iTunes head Eddy Cue, and Apple Music’s head of content Larry Jackson. The album was launched as an Apple Music exclusive for five days on the 29th of April and is a good sign for both Apple and Drake. Apple Music has been using artist launch exclusives such as this to gain customers for the streaming service. Apple Music is locked in a battle with Spotify for the digital music streaming crown. At last count, Apple Music had around 17 million subscribers, while Spotify has over 40 million paid subscribers. Apple Music has no free ad-supported tier, unlike Spotify which has around 60 million for its free service. It claims that the free service helps convert to the paid service, although many artists and record labels are not happy with the arrangement. The momentum still appears to be with Spotify as, during the last two months, Apple Music has added approximately 2 million new subscribers, while Spotify added 10 million. Spotify has network effects which help its growth so it will likely take exclusives such as the one with Drake for Apple Music to achieve the same rates of growth.